Develops your typing skills using a proven approach to learning, one success at a time. I understand this is a download only item. 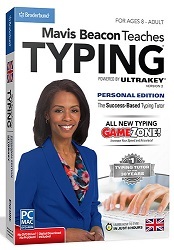 This new version of Mavis Beacon Teaches Typing Personal Edition develops your typing skills using a proven approach to learning, one success at a time. With 12 interface themes and countless program options to adapt to age, needs and style, you can master the basics of typing at your own pace and even see successful results in just 8 hours. Suitable for anyone wanting to learn to type from ages 8-88. Just follow these 7 easy steps to achieve your typing success! Success-based learning begins with setting a personal challenge level for speed and accuracy that you work towards as you complete lessons. A virtual reality model demonstrate correct body and hand shape. For each lesson you complete a corresponding skill check using real-world typing challenges to ensure your progress. Timed typing tests give standardised performance results that you can put on your CV. After just 8 hours of using this software you can master typing basics and more. Comfort and productivity go hand in hand with the Kensington Comfort Type USB Keyboard. Turns your tablet, phone or other supported device into a miniature notebook computer. Make the move to superior comfort with this breakthrought keyboard design.